Two years ago, I had that cinematic bathroom moment everyone knows by heart. You know, the one where the girl pees on a small plastic stick and thereby uncovers one tiny truth that will snowball into something huge enough to change several lives--she's about to become someone's mother. That was my literal first thought after seeing the positive result, the idea that someday, someone is going to say 'Mom, come here'...and they're going to mean ME. I remember studying my face closely in the bathroom mirror, examining every crease and pore, waiting for the mother within to reveal herself. 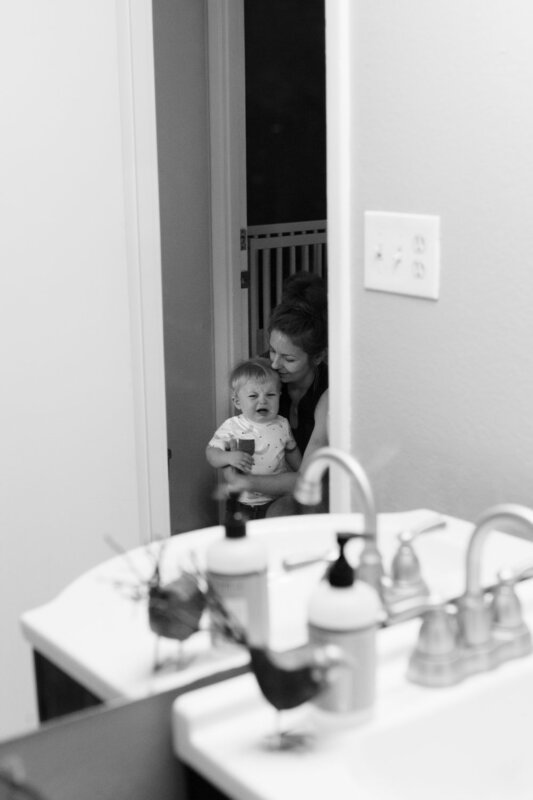 Impending parenthood wasn't a surprise (we had recently decided we were 'trying,' or at least not not-trying), but it was a shock to every cell of my being nonetheless. I want more time. The age-old cry of the brand-new parent goes like this, simply......I want more time. Time spent daydreaming, reading books, creating. Time spent drinking in the sweet realness of my son (who is already not a newborn anymore, how is he already not a newborn anymore? ), his warm weight on my lap, all flailing fists and head-swiveling insistence on seeing every bit of the world around him. Time spent drinking in the sweet realness of my husband as well, rather than passing like weary yet affectionate ships in the night. Time spent focusing uninterrupted on work for a whole hour at a time, doing a really great and thorough job for once, instead of rushing from deadline to deadline. Time spent sipping a cup of coffee while it's still hot and steaming. Time spent enjoying my kitchen. I want one hundred hours in a day so that I can squeeze all of these beautiful things in, without one thing crowding out the others, each item on my list jostling the others and desperately vying for attention. I want more time, but there are dishes, emails, the piercing wail of colic, conference calls, soothing infant backrubs, terrifying trips to the pediatrician, more dishes, laundry and dog walking to get through...and I'm not going to be getting those hundred hours in my day any time soon. The best that I can do--chronically exhausted, shipwrecked on the shores of new parenthood without a compass--is to show love for my little family in the small ways I feel capable of. More often than not, this means some type of food. It may not be a traditional, long-simmered pot of Sunday sauce or an elegant nine-course tasting menu, but avocado toast is one of those humbly sublime dishes that seems to magically transform into something even better than the sum of its parts. It's a favorite for the two adults who live in this household, and while Henry isn't eating anything firmer than breastmilk yet, avocado will almost definitely be among the first foods he tries. Avocado toast will be on the menu for him someday, and I'll serve it just like this: simple bread rubbed with olive oil and toasted on one side, loaded with fork-smashed green fruit and a hefty sprinkling of sea salt and pepper. I may not be able to concentrate on anything for longer than five minutes, but in less time than that, I can put love on the table in front of my family. No one needs a recipe for avocado toast, but in case you want one anyway, here it is: Brush olive oil on bread, slide under broiler, smash avocado on toast, sprinkle with salt & freshly ground pepper, eat, smile, love.